Hatchlings emerging from a nest will instinctively be drawn to a light source along the beach. On a natural beach with no artificial light the light of the seaward horizon guides the hatchlings to the waters edge. Artificial light can disorient the hatchling. As a result they will travel towards the light source rather than the ocean. Sea Turtle populations have suffered significant losses in recent years. It is estimated that only 1 out of 1,000 survive to sexual maturity at 30 years of age. Their recovery largely depends upon our efforts to manage the effects of expanding human populations and other anthropogenic effects. Light pollution may be one of the most easily managed. 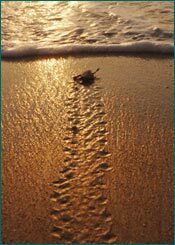 In September 2013, St.Johns County enacted Article IV section 4.01.09 of The Land Development Code establishing a Light Management Plan for the protection of Florida’s federally listed threatened and endangered nesting marine turtles in St. Johns County. In August 2006, St. Johns County received approval from the United States Fish and Wildlife Service (USFWS) for a 20 year Incidental Take Permit (ITP) and Habitat Conservation Plan (HCP). One of the conditions of this permit was to have the lighting ordinance fully enforced in the unincorporated 41.1 miles (66.1 km) of Coastal St. Johns County. Eliminate or turn off all unnecessary lights, such as landscape lighting. Reduce the wattage of necessary lights, simply reducing the wattage of a bulb may be sufficient to bring lighting into compliance. Replace white lights with amber, orange or red LED's or 25 watt yellow bug lights. Studies have shown that the long wave length spectrum of light (ambers, reds, yellows) is less attractive to sea turtles. Redirect fixtures away from the beach. In some cases slightly angling or rotating the lights away from the beach can bring the lighting into compliance. Reposition lights behind existing barriers to shield them from view. Reducing the height of pole-mounted fixtures may resolve many problems. Placing a shield on the seaward side of a fixture is often an easy and inexpensive solution to lighting problems. Plant natural dune vegetation to provide a buffer between the beach and the light source. Install timers and/or motion detectors in areas where public safety or security lighting is of concern. 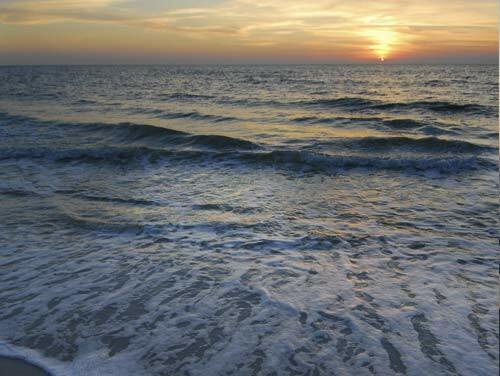 If you need assistance with beach lighting issues please contact our office at (904) 209-0323.